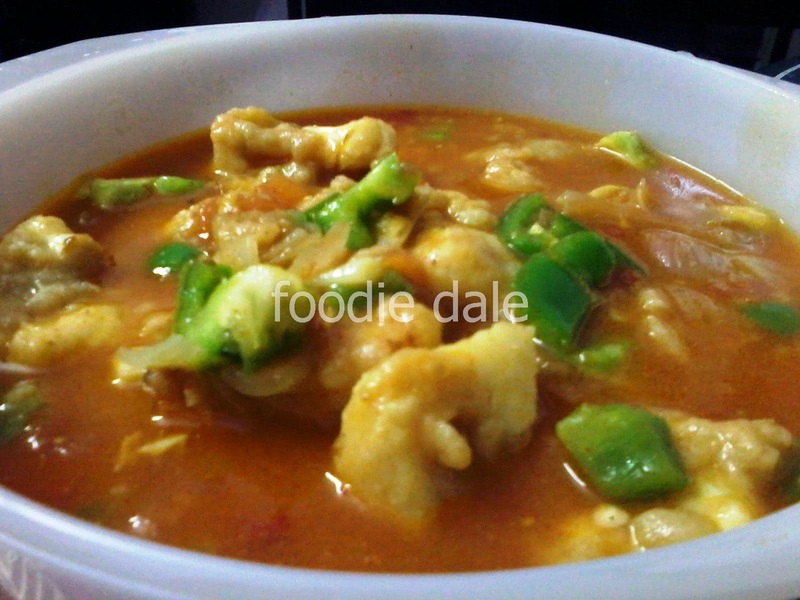 " Cauliflower or Gobi manchurian is a Indian chinese food item prepared in combination of deep fried florets and cornflour saucy gravy.. and can be used with either rice or rotis...Make sure to clean thoroughly the cauliflower/gobi in running water and keep it aside in salt and turmeric water or vinegar for about 20 minutes for removing pesticides sprayed on it for our family's health safety..."
Cut cauliflower/gopi into medium sized florets and take water in a vessel and boil the florets in it for 5 minutes. Drain and wipe out water with a clean kitchen towel. Take a bowl and add maida, gingergarlic paste, salt and water and make it a smooth batter. Mix well and coat it on the florets and deep fry. Drain and transfer it to plates. Now take a deep bottomed vessel and heat it and add a tsp of oil in it. When oil is heated add the chopped gingergarlic paste and salt and black pepper & saute well. If needed you can add tomato ketchup, chilli and soya sauce(I didnot use it here becoz of kids safety) or else add chopped tomato and saute well until it blends. Now pour boiled water and bring it to boil once done dissolve 2 tbsp corn flour in half cup of water and mix it well and add in it. When the gravy thickens put off the flame and garnish with chopped capsicum or coriander, spring onions and serve hot!! I like gopi manchurian. Its taste very yummy. Thanks for sharing. Thank u dear Maha Lakshmi...If you have any further queries plz feel free to contact..Thank u so much.